Have you decided that you want (or need) to pass SAP BI certification? Nice! If you are still thinking about it and cannot decide, then this article may highlight some pros and cons of getting certified. Before you start your preparation for SAP BI certification, it is a good idea to make a plan with the topics that have to be learned and practiced. In order to draft a good preparation plan, you need to know exactly what areas of knowledge related to Business Intelligence are going to be tested at the certification. Otherwise, you might spend your precious preparation time on studying things that will never be asked at the exam. This is why you should consult with SAP BI certification syllabus before the preparation is started. 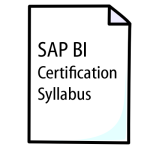 Below you will find an up-to-date SAP BI certification syllabus. We encourage you to make sure that in you preparation for SAP BI certification you cover all the areas mentioned in the syllabus. SAP BI certification syllabus is presented as a table with three columns. The first column states a topic, the second column indicates the overall importance of this topic in certification, and the third column contains the names of SAP training courses that explain this topic. Make sure that you study hard before SAP Certification. To be sure in success you should go through all the topics listed in SAP BI Certification syllabus 3-5 times. Good luck with your exam! P.S. Would you like to test your knowledge of SAP BI module before certification? Try sample SAP BI Questions.